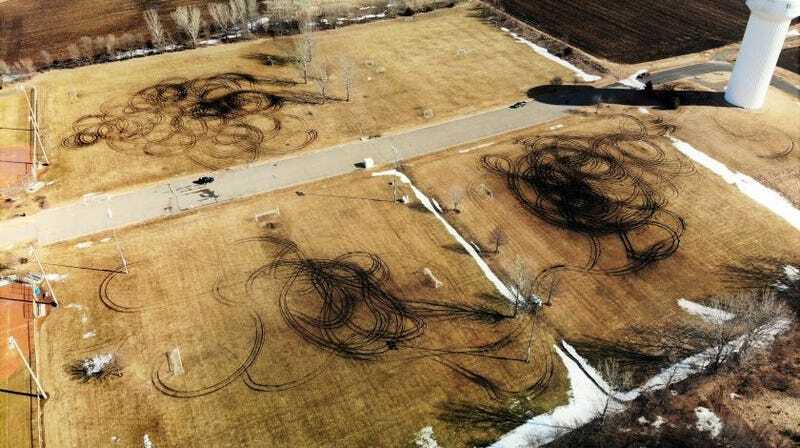 Police in Hastings, Minnesota have identified two men they suspect of driving onto the Veterans Athletic Complex and doing a ludicrous amount of donuts, damaging over 200,000 square feet of soccer fields in the process, according to ABC 5 Eyewitness News. The two men, who have not been publicly named yet but whom police expect will be charged in the coming days, snuck onto the fields on Sunday and caused what KARE NBC 11 is reporting will be tens of thousands of dollars in property damage. On top of the financial hit to the city (though they are already looking to file an insurance claim to help with the costs), this will also have an effect on Hastings Football Club, which has 125 games scheduled on the fields between now and June 3. There are over 570 kids signed up for the club, which provides all sorts of soccer training and match play. Certainly an enormous waste, unless the vandals perpetrated the crime as part of a shot-for-shot remake of the Big Tymers’ “Get Your Roll On” video.